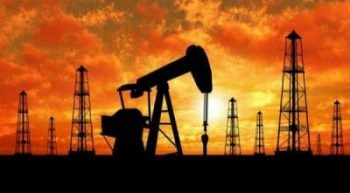 Fears of fresh escalation in Syria’s war coupled with compliance with a pledge by the OPEC cartel and Russia to limit production are pushing up global crude prices. Crude reserves have declined substantially on increased demand but there has not been any corresponding increase in supply. There are talks of Saudi Aramco, the leading crude oil drilling co of Saudi Arabia to come out with an IPO over the next year. In that case in their own interests Saudi Arabia could push up the price to $80-85 before the IPO for better valuations. As we can see from the chart below an increase in crude price is not always bad for the Indian markets. Typically the surplus profits generated by oil producing countries to an extent are invested in emerging markets like India. Thus we see an increase in FII activity/inflow whenever crude price goes up beyond a level. 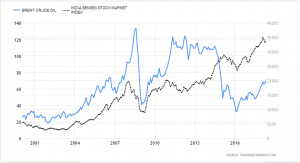 Thus though a high crude price may not be good for the Indian economy it is definitely not so for Indian markets. One good thing is that with time dependence on imports has declined marginally & domestic institutional flows into Indian markets have strengthened. 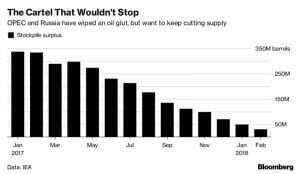 This was evident in 2016 when crude declined to $27/bbl & we witnessed strong FII outflows. Coincidentally that was also the short term bottom for the markets. One more observation is that barring some short periods of time in general there is an inverse relation between crude price & USD-INR exchange rate. 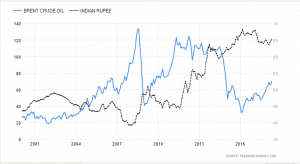 Except for 2012-2013 in general we see that whenever crude price has gone up the rupee has been strong. 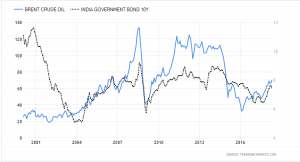 Another observation is that there has been a strong co-relation between crude & 10-year G-Sec bond yields in India. Higher crude prices lead to inflation & inflation in turn leads to increase in bond yields. Thus this is to an extent on expected lines. Thus an increase in crude prices may be bad for macro-economic indicators in India but it may not translate into a decline in Indian equity markets. But as a bond investor it might not be very good news.